It started snowing as we were getting ready to head to church for our son’s First Reconciliation. 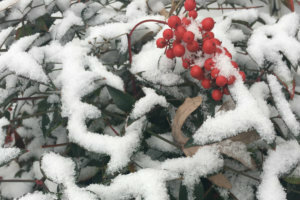 I hoped the snow wouldn’t interfere, and it seemed just to add to the excitement, the specialness, of the day. Over the past few months, I have worried about whether our little boy was ready for this sacrament. Maybe it’s because he’s our younger son. I just wasn’t sure. But I have watched him and listened to him through our lessons together. He has learned so much. He understands. It’s worrying as a parent not to know whether your child is ready for something—whether it’s going to kindergarten, becoming a big sibling, walking to the mailbox, or spending the night at a friend’s house. But often I think you’re never fully ready—and you certainly don’t know whether you’re ready—until you’re actually immersed in the experience. All you can do as a parent is prepare a child well and then let him take the leap. In the case of First Reconciliation, we just need to do the very best we can to prepare our children and trust that God will take care of the rest. At church, our second grader hurried to get in line. Soon it was his turn. He went into the reconciliation room, and I stood at a distance. When he came out, he ran to me, radiating joy, a huge smile on his face. The rest of our family waited for our turns, and one after another we received the sacrament, too. It was the first time we all received a sacrament on the same day. It made me realize that when Daniel makes his First Communion, that will happen for the four of us every Sunday. Maybe it’s because we just celebrated the anniversary of the day we met Leo, and Daniel’s birthday is next week, but right now I’m very focused on how our family has been brought together. The idea of also being able to share our faith and grow closer to Jesus by receiving God’s mercy and grace—and soon Jesus in the Eucharist—fills me with awe. I think of so many times I have worried about whether I was ready—for marriage, for motherhood, for greater responsibility, for journeys I never intended to take and wouldn’t have chosen for myself. But God has always given me what I needed and guided me. I have to believe He will do the same for me this Advent, as long as I do my part to open the door and let Him in. And I know He will do the same for you.